There's just something about Ritter Sport squares that makes them better than the average chocolate bar. I'm not sure if it's the square shape, the boldly basic packaging, or the plethora of flavors that appeals most to me, but I'm pretty hooked. Although it's not a cereal I tend to reach for at the store, I do like Corn Flakes. They're quite versatile! One of my favorite comfort foods is cheesy potato casserole with corn flake topping - so healthy, right? But this is my first foray into chocolate with cornflakes! Here's a bit of Halloween promotional fun from Ritter Sport: they are having a giveaway for fans who use their online application to send Halloween e-cards. Check out this entry at the Ritter Sport blog for details on how to use the application and enter to win a box of 84 Ritter Sport minis. Ritter will be giving one away every day until November 6! 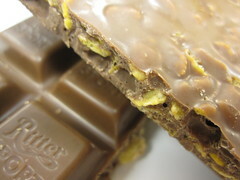 The bar looked fresh and appetizing, and I especially loved the bumpy bottom texture from the cornflakes. It smelled mildly of cocoa, and the milk chocolate certainly was mild here. The cornflakes cut down on the creamy, sticky feeling of the chocolate (which suits me just fine). 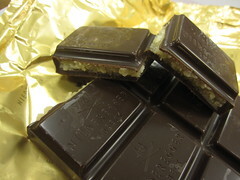 While they didn't add much in the way of flavor (just a hint of vegetable sweetness), the texture the cornflakes brought to this bar was great! The crunch was different from that of puffed rice or wafers, and the cornflakes seemed very fresh (not stale or soggy). The bar was a little on the sweet side for my tastes, but if I'm ever in the mood for crunchy milk chocolate, I might pick this one up again! Information on the Ritter promotion was sent by a PR representative, and Ritter Sport is hosting the giveaway - not me. It did not influence my review in any way, nor did I receive anything in exchange for blogging about this promotion. 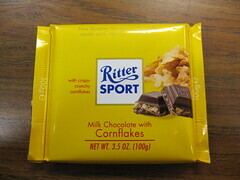 Luckily, I just happened to have a Ritter Sport square on deck for review! There's a lot of chocolate in my house these days, and I've been slowly working my way through it. Thanks to various colds and sinus issues, I haven't been in the mood for tasting much of anything, but my taste buds seem to be functioning again so I'll keep trying to stay on top of it. This bar was part of a birthday present from my sister, so I'm not really sure where she got it. 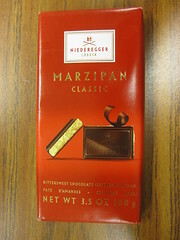 Marzipan is a new favorite of mine, discovered when I tried Ritter Sport Marzipan earlier this year. When marzipan pieces are included in chocolate or truffle boxes, they are always some of my favorites, but my exposure is still pretty limited. The gorgeous gold wrapper caught my eye, as did the glossy bittersweet chocolate. The bar had a nice slightly bitter cocoa scent with a subtle, cherry-like hint of almond, which was a great start. The pieces snapped apart in a satisfying (though sometimes uneven) way, and the marzipan inside looked moist (in an appetizing way - some people are weird about that word). The chocolate coating had a decent balance of bitter and sweet, and it did a good job of accenting the marzipan with a slight fruitiness. This marzipan had all the lovely cherry or amaretto notes I adore. The paste was slightly drier than in other marzipan chocolates I've tried, but I was able to put that aside because the flavor was really lovely. A couple years ago, I ate at the Ghirardelli Soda Fountain and Chocolate Shop in Orlando, Florida's Downtown Disney. I still remember the deliciously bittersweet cookie sundae I split with my husband. 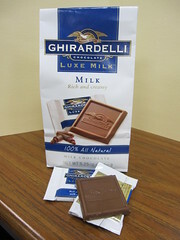 This is what immediately comes to mind when I think of Ghirardelli chocolate, so my opinion of the brand is pretty positive. 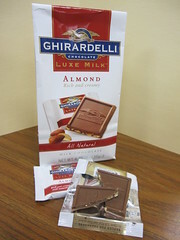 A marketing company representative kindly provided me with coupons for free products from Ghirardelli's new Luxe Milk line of all natural chocolatse, and in my area, I was able to find the Milk and Almond squares, as well as two bars to be reviewed shortly. As always, I wasn't paid for this or any review. For any readers in the New York city area, Trident is doing a bit of exciting non-traditional marketing in Times Square today from 6:30 AM until 2:00 PM. At Broadway and 42nd street, a fleet of taxis will give rides in exchange for a pack of this gum. There will also be celebrity appearances (Bethenny Frankel and Wendy Williams), free samples of the new flavor, and chances to win prizes instantly, or by snatching as many mint leaves in a "Grab for Mint" cyclone booth. It sounds pretty refreshing! 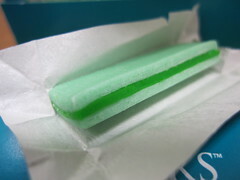 The gum smells like mint, and if I had to nail it down, I'd say spearmint. As I chewed, the melon flavor came out from the sticky center. It was like an extra tart almost honeydew, and it went very well with the mint. The sourness made the melon come off a bit like lime, but it was very subtle. 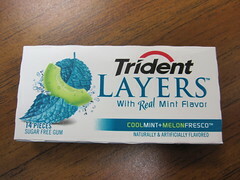 It's definitely my favorite of the Trident Layers flavors, and it's something I would buy again. The refreshing flavor lasted a very long time (probably around 20 minutes), and the gum had a good texture throughout the chew. If fruity-mint gum is not your thing, you may not like this one, but this gum was really well received by my friends and coworkers when I shared the pack. Sugar free gum knows no limits these days. 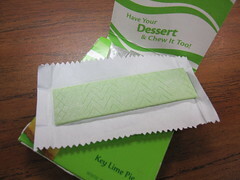 This Key Lime Pie gum didn't show up at my local grocery store at the same time as the Mint Chocolate Chip and the Strawberry Shortcake, but it's probably the oddest of the three flavors. Once I sample a gum flavor and take pictures, the rest of the pack usually goes on the corner of my desk, both to save my jaw and to share with my coworkers. 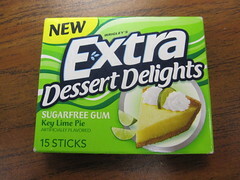 It doesn't seem like the Key Lime Pie gum is a big hit, at least not compared to the other two Extra Dessert flavors. The scent and taste were pretty much a dead ringer for key lime pie, but there was something about the cream element that was just a little too sour for me. It didn't stop me from enjoying the gum, but the delicate balance of citrus and cream that didn't translate here. The taste was another Willy Wonka experience, because I could have sworn I sensed a graham cracker crust, along with tart and acidic key lime and that bizarre cream sensation. The lime and cream didn't play as well here as the strawberry and cream in Strawberry Shortcake, but that weird sour note did eventually go away, and I didn't notice it as much the next time I tried a piece. The flavor faded to a very mild, sweet lime gum pretty quickly (maybe after 2 minutes), and it became a little tough to chew. Still, this was another fun dessert experience from Extra, but not my favorite of the three flavors. Extra gets extra points for trying something different.